We have joined TCFA in their efforts to upgrade exhibition elements in the Conservatory auditorium. The 2500 sq. ft. space boasts thirty-foot ceilings, three pairs of triple-hung windows on each side wall, a stage, and a balcony. Its scale makes for a premier location for art exhibitions and, over the past two years, we have made much-needed improvements for this purpose. 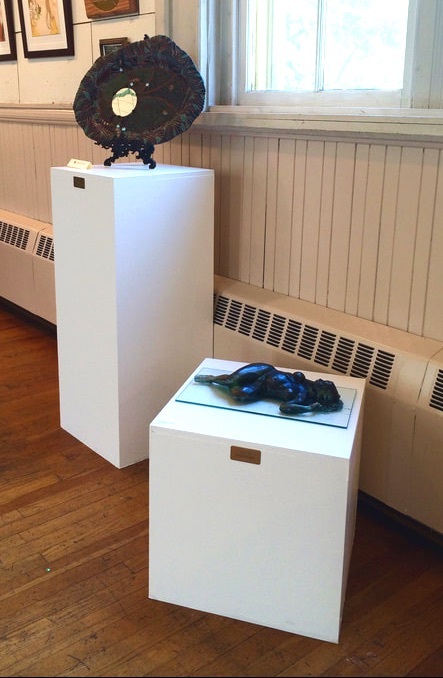 Our first joint fund-raiser, the Pedestal Project, resulted in fourteen new pedestals. Next we replaced the beaverboard on the exhibition walls with sheet rock and, thanks to a grant from the Delavan Foundation, we added a new all-in-one lighting and hanging system around the room. The completion of these projects signal the beginning of year round art exhibitions in the Conservatory! Stay tuned for details. We now have our sights on the wooden floors which need refinishing. Imagine how much more beautiful the space would be with glistening floors! Please consider making a donation to this worthy cause as we strive to improve our gallery space for years to come!